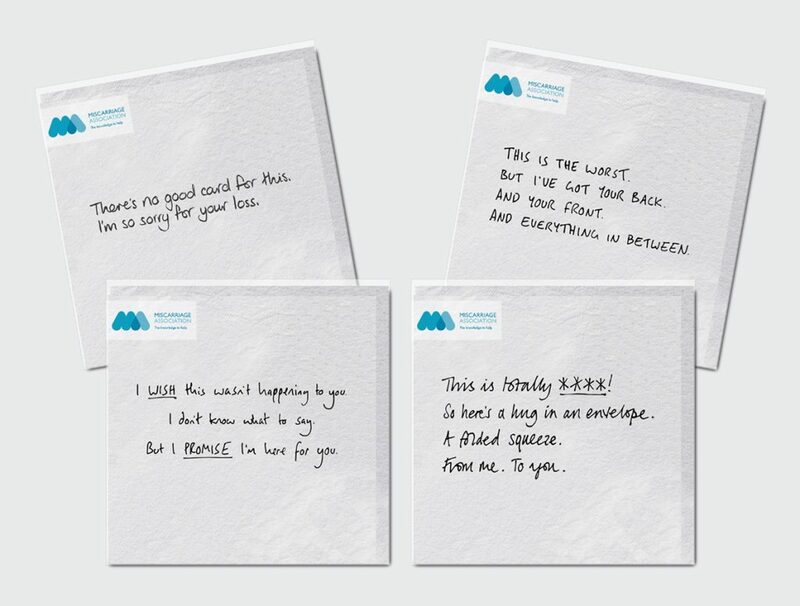 I was absolutely delighted to hear from the Miscarriage Association yesterday that they were launching a range of cards for people to send to friends, colleagues or family members who had experienced a miscarriage. It can be so difficult to know what to say when someone has a miscarriage, and sometimes the tendency is to just ignore it entirely if you are worried about saying something wrong or upsetting the person concerned. The cards have been created for the women and men who go through miscarriage, ectopic or molar pregnancy and the friends, families and colleagues who wish they knew what to say to them. The cards carry thoughtful messages, approved by a panel of women who have been through miscarriage themselves, and the details of the Miscarriage Association inside, putting help and support directly into the hands of the person who needs it the most. The cards were launched today and are and stocked at PostMark’s London stores and online (https://postmarkonline.co.uk/). They were devised and created by creative agency MRM//McCann. Baby Loss Awareness Week starts today with a series of events across the country to give an opportunity for parents, families and friends to commemorate and to create an opportunity to raise awareness and talk more openly about miscarriage, stillbirth and loss. On October 15 at 7pm, you can join in the wave of light by lighting a candle to remember all the babies that have died too soon. There is more information on the Baby Loss Awareness website and there will be remembrance events held across the country. Details are posted below, but you should double check times and locations on the website. Aldershot – St Michael and St George Church, Queen’s Avenue, Aldershot. Thursday 12 October 7 pm. Aldershot – Aldershot Baby Garden, The Park Crematorium Guildford Road, Aldershot. Wave of Light Sunday 15 October 6:45 pm. Ashford – Ashford Memorial Gardens, Ashford. Wave of Light Sunday 15 October 6:45 pm. Banbury – St Mary’s Church, Banbury. Wave of Light Sunday 15 October 6:30 pm. Barking – Town Hall. Wave of Light Sunday 15 October 6:30 pm. Belfast – Malone House, Barnett Demesne, Belfast. Balloon release Sunday 15 October 2 – 4 pm. Boroughbridge – St James’ Church, Boroughbridge, North Yorkshire. Monday 9 October 7 pm. Bristol – City Hall, College Green, Bristol. Wave of Light Sunday 15 October 5 pm – 6 pm. Email Bristol Sands with queries. Canvey Island – St Nicholas Church. Sunday 15 October 6:30 pm. Cardiff – Wenallt Chapel at Thornhill Crematorium, Cardiff. Wave of Light Sunday 15 October 6.45 – 7.15 pm. Email Cardiff and Newport Sands with queries. Carshalton – St Helier Hospital. Wave of Light Sunday 15 October 7 – 10 pm. Chesterfield – Brimington Crematorium. Wave of Light Sunday 15 October 6:45 – 8 pm. Coventry – Coventry Cathedral. A Service of Remembrance Sunday 15 October 2 pm. Cramlington – Northumberlandia. Wave of Light Candle Walk Sunday 15 October 6:30 pm. Please note booking required call 07531 206784. Devizes – St.James Church, Devizes. A Service of Remembrance Sunday 15 October 4:30 pm. Glasgow – The Memorial Chapel, Main Building, Gilmorehill Campus, University of Glasgow, Chapel Corridor (South), West Quadrangle, Glasgow. Wave of Light Sunday 15 October 6:15 pm. Gosport – St. John the Evangelist, Forton Road, PO12 4TQ. Wave of Light Sunday 15 October 6:30 pm. Greenhithe – Bluewater. Wave of Light Lantern Walk Sunday 15 October 6:45 – 8 pm. Guernsey – Guernsey Sands Pregnancy and Infant Loss Remembrance Walk Sunday 15 October 10 am. Guildford – Halfpenny Lane, Guildford. Wave of Light Sunday 15 October 5:30 – 8 pm. Harrogate – St Mary’s Chapel, St Peter’s Church, Harrogate Tuesday 10 October 10 am – 12:30 pm. Isle of Man – Douglas Promenade. Wave of Light Sunday 15 October 6:30 pm. Leeds – Church of the Epiphany, 227 Beech Lane, Gipton, Leeds. Wave of Light Sunday 15 October 6:45 pm. Liverpool – Isla Gladstone Conservatory, Stanley Park, L4 0TD. A Service of Remembrance Wednesday 11 October registration of babies names from 5 pm and service at 6:30 pm. London – Trafalgar Square, London. Walk Of Baby Loss Remembrance Saturday 14 October 5:30 – 7:30 pm. Ludlow – St. Laurence’s Church, Ludlow. Wave of Light Sunday 15 October 6:30 pm. Middlesborough – St. Hilda of Whitby, Grangetown. Wave of Light Sunday 15 October 7 pm. Newburgh – Newburgh Parish Church, Fife. Wave of Light Sunday 15 October 6:30 pm. Norwich – City Hall, Norwich. Sunday 15 October. Nottingham – Memory Walk, Wollaton Hall and Deer Park, Nottingham. Saturday 14 October 11 am. Oban – The Rockfield Centre, 53A Rockfield Road, Oban. Wave of Light Sunday 15 October 6:30 pm. Oldbury – Warley Baptist Church, Castle Road East, Oldbury. Wave of Light Sunday 15 October 6:30 pm. Plymouth – Little Haven Memorial Garden, Derriford Hospital, Plymouth. 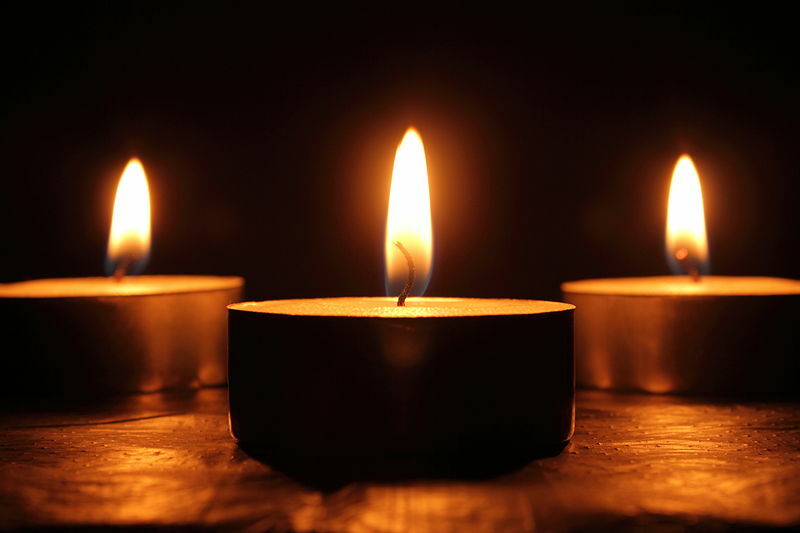 Service with candle lighting Monday 9 October 6:60 pm. Plympton – Safe Haven, Harewood House, Plympton. Screening Still Loved documentary Tuesday 10 October 6 pm. Portadown – St. Mark’s Church, Portadown. Wave of Light Sunday 15 October 6:45 pm. Reading – Reading Minster, Reading. Sunday 15 October 3 pm. Rochester – Baby Memorial Garden, Borstal Road, Rochester. Wave of Light Sunday 15 October 6:45 pm. Rudgwick – King George V Playing Fields car park and the Village Hall, Rudgwick RH12 3JJ. Information and awareness event hosted by Dandelion Farewells Monday 9 October 10:30 am – 2:30 pm. Shetland – Toll Clock Shopping Centre, Lerwick. Saturday 14 October 9 am – 4 pm. Thatcham – London Road Cemetery, Thatcham. Wave of Light Sunday 15 October 6:30 pm. Thurso – Thurso Baptist Church, 5 Millbank Road, Thurso (Caithness). Wave of Light Sunday 15 October 6:30 pm. Truro – Truro Methodist Church. Sunday 15 October 2 pm. Whitburn – Souter Lighthouse. Wave of Light Sunday 15 October 6:15 pm. Woking – St. Mary Of Bethany Church, Woking. Wave of Light Sunday 15 October 6:30 pm. Wrexham – St Mary’s Cathedral, Wrexham. Baby Remembrance Service Sunday 8 October 3:30 pm. York – Upstairs Lounge, The Gateway Centre, Acomb, York Wednesday 11 October 11:30 am – 1:30 pm. Miscarriage is devastating, and often women find it hard to talk about so the idea of an Instagram account for women to come together to discuss their experiences may sound slightly bizarre – but in fact, many women have found the I Had a Miscarriage Instagram pages very helpful. It was started by a psychologist, Jessica Zucker, in 2015 and already has more than 17 thousand followers. The account has become a space for women to connect, to share their feelings and to read about the experiences of others. Losing a baby is particularly difficult if you have been through fertility problems and treatment first, and if you have personal experience of this it is always worth getting in touch with the Miscarriage Association who can provide lots of information and support. 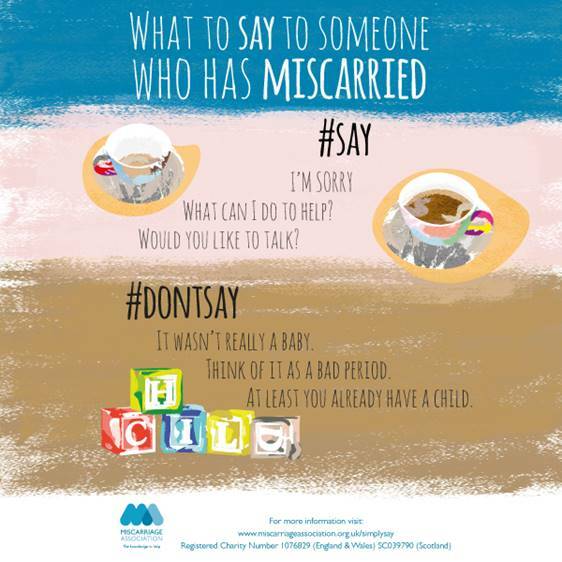 The Miscarriage Association is currently running the brilliant Simply Say campaign to help other people understand more about what to say when a friend, colleague or family member has experienced a miscarriage. I’ve only just seen this incredibly moving article in The Guardian about the experience of miscarriage – you don’t need to have been through the loss of a pregnancy yourself to empathise with this piece. It does make you think about how little other people appreciate or understand what it feels like to lose a baby – especially when this happens more than once. Well worth reading – thanks Amy for writing it. If you are affected by miscarriage, the Miscarriage Association can offer really valuable help and support.